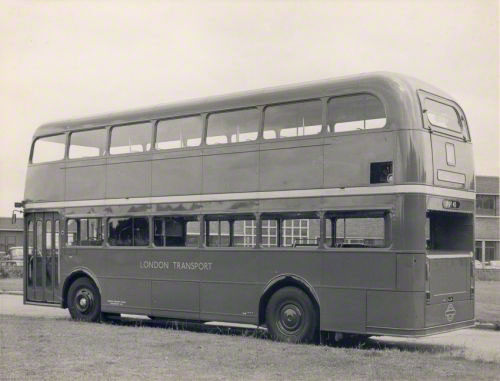 There had been other Routemasters with a front entrance and no rear platform but the FRM differed radically by being rear-engined. 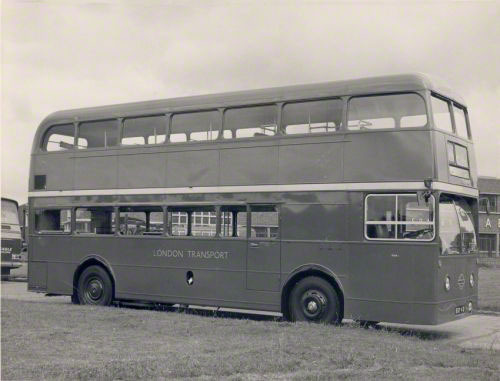 The design of this London Transport commissioned vehicle was begun in 1964, but during its long development time changes were to occur in bus regulations, the most significant of which was the legalisation of one-person-operation for double-deckers in 1966, and this had an impact on the success of the FRM. project was cancelled after the first of the anticipated three prototypes was constructed. The prototype FRM 1 (Body No. B53296) was taken into stock by London Transport as KGY4D in 1966 but didn't make its inaugural public service run until June 1967. Then on August 31st it caught fire (due to an engine flywheel overheating), in Princes Street nearby the Bank of England. Fortunately the Fire Brigade attended the fire swiftly but the undesirability of fixed windows was demonstrated by the Firemen having to break a number of them to release the smoke that had built up. The decision was therefore taken to fit opening windows. This however also served as a useful excuse for not having to redesign the ineffective air ventilation system that should have been extremely efficient in exchanging the air inside the vehicle; given that the original sealed window arrangement relied on this. Even today, in close examination, the after effects of the excessive heat around the upper deck rear air grilles can still be seen. 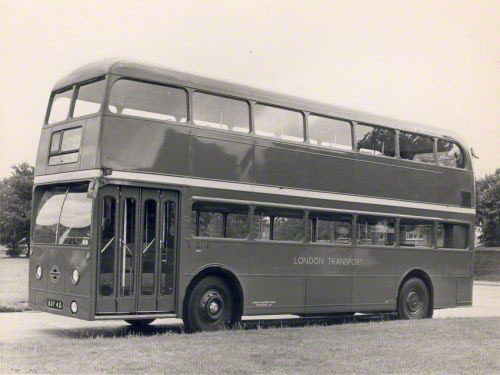 It returned to service in December remaining at various garages until the 1980's, finally being used as a flagship bus for "Around London Sightseeing Tours". It was withdrawn in 1983 and is now in the London Transport Museum Depot at Acton. the Cobham day was probably the last time that the FRM would be run outside of the Acton Depot. Happily this has proven not to be the case as the FRM made an appearance at the Routemaster 60th Celebration at Finsbury Park in 2014. Long may it continue! Click here for the article and pictures about "The FRM outing at Cobham's Routemaster Day"
The pictures above are the first of the FRM taken outside AEC's premises in Southall. This interior is the upper saloon of the FRM and probably taken as one of the set of first photographs above. (see the Vehicle Interiors page). 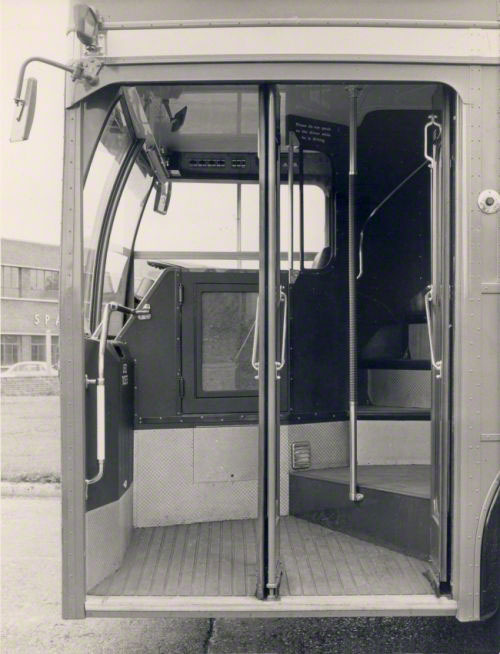 The interior is definitely derived from the Routemaster as both the seating material and the sealed front windows (with air vents above) testify. Also the side windows are sealed as per the original FRM, and lastly there is the front entrance staircase. Here is the FRM pictured in storage in March 2008 at the London Transport Museum Depot at Acton (Click here for the Featured article). It is now said to have some running problems and may well not "see the streets" again. And now for some excellent period images of the FRM in operation during the 60's & 70's culminating with two images taken at the Aldenham Works Open Day in '83. 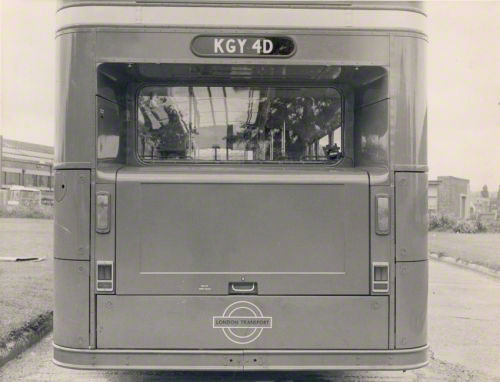 FRM1 seen from a Park Royal-bodied Atlantean (with another behind) at Dalston on route 76 on 9 November 1968. FRM1 in the snow at Roundshaw on Route 233 operating as a one-man-operation (OPO) bus on 12 January 1970. FRM1 at Potters Bar garage on 3 January 1974. FRM1 at Potters Bar station on Route 284 on 3 January 1974 operating as a one-man-operation (OPO) bus. FRM1 at Parliament Square on the Round London Sightseeing Tour on 26 July 1979. FRM1 at the Aldenham Works Open Day on 25 September 1983, with RM8 and single deck RM1368.